One of my presentations of Dining with al-Qaeda‘s messages about Mideast coverage in the U.S. had a good showing in The Morningside Post (1 April 2010 post here), the news and opinion site run by the students of Columbia University’s School of International and Public Affairs (SIPA). Seeing in cold print that I had said that a “great lie” pervades stories about the Middle East made me wonder if I was using the wrong word. After all, I keep saying and believe that we did a lot of honest work as well. If I had my time again I’d probably underline that it was not intentional and call the cumulative effect of all those subtle distortions and omissions that were part of our work a “great error”. After earning his BA in Oriental Studies from Oxford University in 1982, the British reporter spent 25 years covering the region for a variety of publications. 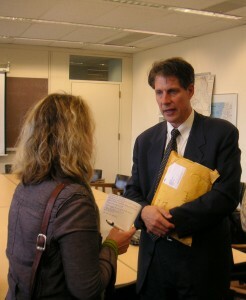 In 2007, however, Pope left journalism behind to work for the International Crisis Group, a conflict-prevention organization. It was in his last 10 years in the field, working as a foreign correspondent for the Wall Street Journal, that he began to see what he calls the “great lie” that pervades media coverage of the Middle East. This wall is characterized by tendencies to view the Islamic world as one monolithic bloc and a lack of understanding of the diverse cultures and realities on the ground. Pope maintains that it is also one of the reasons that the US stumbled into the war in Iraq and is finding it so difficult to get out of Afghanistan. When first year student Stephen Gray (MIA ’11) asked whether the sanitized representation of violence in the American news media also plays a role in such foreign policy decisions, Pope agreed that policymaking might be different if there was a clearer emphasis on the destructiveness of war in the news media. He used the point to underline the distance between American viewers and the current wars on the ground in the Middle East. During the Vietnam War, on the other hand, “there was no such inhibition and that—along with the draft of course—made everyone party to what was going on,” he said. One could add to this the barrage of images of massacred bodies from seemingly generic African civil wars in the news media, reinforcing perceptions of the civility of the West and the brutality of the rest. Pope is not shy about the role that journalists themselves play in contributing to a sugar-coated version of the truth for American audiences, and his own culpability as a result. When he first reported on Israel in the early 1980s, he did not censor his views, he says. And he quickly learned his lesson. While responding sincerely to a US radio host’s question about why US troops were being attacked in Lebanon, the line went dead. Pope spoke of a variety of publications afflicted by the need to oversimplify, appeal to readers and appease the lobbies. More broadly, however, he is calling into question the medium of the newspaper and the news broadcast for accurately reporting on complex conflicts in far away places, where the truth can be difficult to explain as well as difficult to hear. Newspapers have to sell the news afterall, and thus seek to please their audience. In addition, people have a tendency to engage with media that reflect and reinforce their own views. With few challenging questions from his audience, this may also be true of brown-bag lunches. Pope now feels that researching and writing for a non-profit allows him more room to present the story as he sees it, unpalatable as that may be. He writes policy-focused reports on Turkey and Cyprus, their relationships with the Middle East and factors that may influence armed conflict in their neighborhood. “This work that I’m doing at Crisis Group is really everything I thought journalism was going to be when I got into it, but really never was,” he says. “We’re lucky that we got Hugh first,” says Anya Schiffrin, naming some of the next prestigious stops on his tour: The Brookings Institute, The Council on Foreign Relations and The Foreign Policy Institute. No longer a journalist, and carrying three decades of Middle East explorations under his arm, it seems that Pope is now worth listening to.